Each time a president leaves office, they leave something behind. Sometimes it’s long-lasting reform, other times it’s scandal, and sometimes it's wisps of hair. The Academy of Natural Sciences at Drexel University in Philadelphia is currently hosting an exhibit entitled “Presidential Archives: Letters, Hair and Fossils,” which contains—as you may have guessed—some rather unusual memorabilia from early presidents. 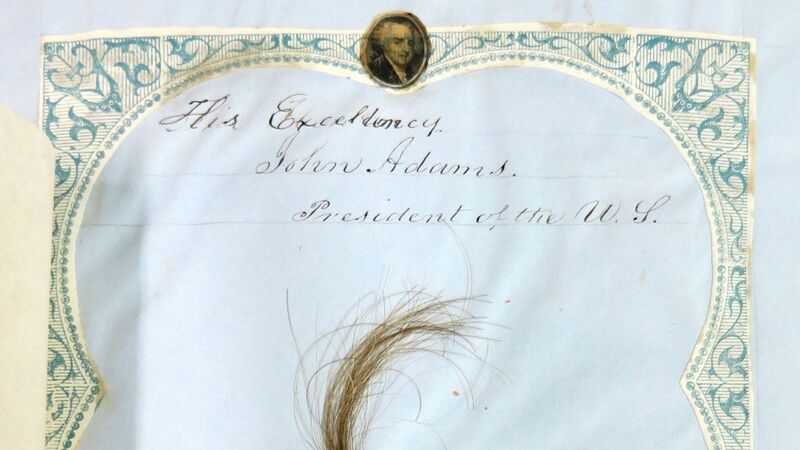 The exhibit showcases locks of hair from some of the most influential American presidents, including George Washington, Thomas Jefferson, John Adams, John Quincy Adams and Andrew Jackson. The hair was collected by Peter Arrell Browne, a Philadelphia attorney, and bequeathed to the museum when he died in 1860. There is also a letter penned by Theodore Roosevelt and fossils from Jefferson’s personal collection on display. In the 19th century, it was not uncommon for family members to keep locks of hair. Browne contacted presidential families asking for locks for his collection and most were happy to oblige. Letters from this correspondence are also on display. The exhibit runs through July 29 to coincide with the Democratic National Convention. Should Bill Clinton stop by during the convention, the Academy has said that it is prepared with shears.